This recipe actually reminded us a lot of the Nutella oat pancakes I've made in the past, but minus the Nutella. And while that recipe uses quick-cooking oats, this one involves old-fashioned ones that you soak for 10 minutes in buttermilk. This soaking process gives the pancakes a unexpected creamy interior texture. With such a short soaking time, by the time you finish prepping the dry ingredients and messing about in the kitchen in the usual way, it's time to proceed by adding a lightly beaten egg (I did not separate the egg and try the tip for extra fluffy pancakes in this case), a tablespoon of maple syrup, and vanilla extract. No oil or butter involved. Gently stir in the dry ingredients (white whole wheat flour, baking powder, baking soda, salt) and mix until just combined. Lumps are good in pancake batter, as you know. To cook the pancakes, I warm and lightly grease my griddle. If you aim for portion control, you can make up to 12 pancakes using a scant 1/4 cup of batter each. I like my pancake size to be a bit more generous (and I think we can afford to be generous here) and use a 1/3 cup measure for each. Because there's no oil/butter in the batter, use a gentle hand in flipping the pancakes but it's really not an issue. Now, let me circle back to the nut butter spread talked about in the recipe. To cut down on the sugar and up the fiber/nutrition content, Cooking Light suggests making an almond (or other nut) butter sauce by whisking almond butter, an equal amount of warm water, and a little maple syrup together. Since I sometimes spread peanut butter (and sprinkle coarse sea salt) on my waffles, I thought this was an interesting idea. But since I didn't have almond butter on hand, I grabbed my peanut butter and made myself a little PB sauce/spread (shown in the photo above). It's actually such a smart idea to thin out/stretch your nut butter with a little water! A little goes a long way and even though peanut butter is thicker, making it harder to make a pourable sauce, I just smeared some on my pancakes and the flavor was so strong that I found I needed just a little. It's a really good idea but if you're into the classic and prefer more sweetness, like my husband does, a little macerated strawberries and maple syrup works beautifully. I'm so happy this post gives me the perfect excuse to put this straightforward classic buttermilk pancake recipe on my blog for quick reference! 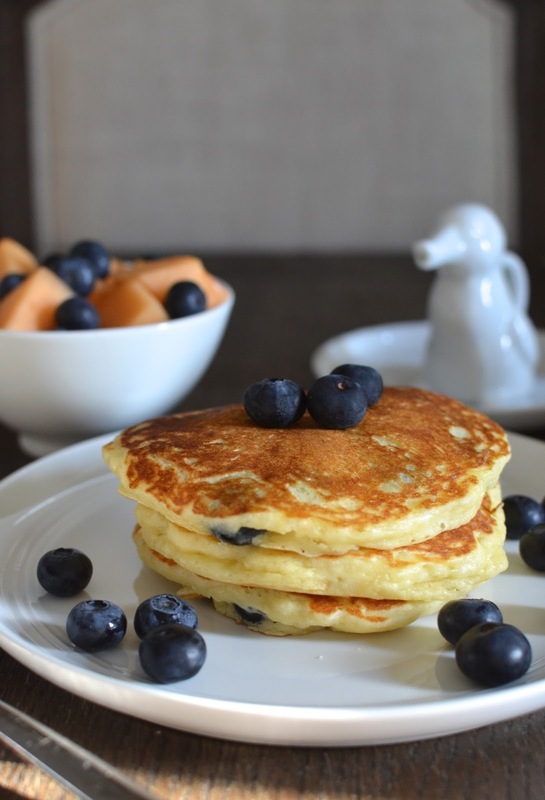 I rotate between a few buttermilk pancake recipes but this has been my favorite as far as easy and tasty goes (otherwise, these overnight buttermilk pancakes can't be beat) and I've been using it often lately. It's from Christina Lane's savory cookbook - the only thing I do is add salt that was missing in the recipe. It starts with a cup of flour, a cup of buttermilk, an egg, and is just a simple, classic recipe that makes a tasty batch of about 8 pancakes (depending on the size you like to make). For the twist, I separated the one egg in the recipe and stirred in the unbeaten egg white at the very end. Don't whisk or whip it, just gently stir the egg white into the batter until just incorporated. I had a great batch of blueberries on hand so I made some blueberry pancakes (my husband loves blueberry muffins and pancakes). After lading 1/3 cup or so of pancake batter onto the griddle, I just sprinkled some fresh blueberries on top. Let it cook a few minutes as usual and flip. All this pancake talk is making me crave breakfast! Here's to the next weekend when we can get flipping and eating our flapjacks again. Combine oats and buttermilk in a large bowl. Let stand for 10 minutes (this soaking process helps make for a creamy interior texture in the cooked pancakes). Whisk flour, baking powder, baking soda, and salt together in a bowl. Stir maple syrup, vanilla, and egg into the oat mixture. Add the dry ingredients and stir together until just combined. Heat and lightly grease a griddle or nonstick skillet over medium. Ladle batter onto the griddle (use a scant 1/4 cup of batter to make up to 12 pancakes; I prefer larger pancakes using a 1/3 cup measure). Cook for 2-3 minutes, until tops are covered with bubbles and edges start looking cooked and set; flip and cook for another minute or so. Serve warm with desired toppings/accompaniments. *Almond butter sauce: Whisk 1/4 cup almond butter with 1/4 cup warm water and 1 1/2 tablespoons maple syrup until smooth. You can substitute with another kind of nut butter. If you use peanut butter like I did, your sauce will likely be a thicker consistency that's more like a spread. In a small bowl, whisk together the flour, baking powder, sugar, and salt. In another bowl, whisk together the buttermilk, egg, butter, and vanilla extract. Stir the wet ingredients into the dry until just combined. There should still be some lumps in the batter. Heat and lightly grease a griddle or nonstick skillet over medium until hot. Ladle 1/4 to 1/3 cup measure of batter per pancake. Cook until bubbles appear on the surface of the pancakes, then flip and continue cooking the other side until golden brown. Serve warm with your choice of accompaniments. * Optional twist: This is a a tip for making extra fluffy pancakes by separating the egg and stirring the egg white (without whipping) into the batter at the last step. If doing this, separate the egg and add only the egg yolk into the batter when combining the wet ingredients. Continue with recipe and gently stir the egg white into the batter at the very end. Cook according to instructions. So very soft and fluffy! We eat quite a bit of pancakes too, but usually sourdough pancakes since I always have rye/einkorn starter in the fridge. Pancakes are breakfast comfort food...and your sourdough pancakes (!) sound amazing! Thank you for these brilliant tips! You make me want to eat pancakes this morning. Soaking the oats and adding the egg whites at the end make perfect sense. Thank you very much for passing these along! You are so sweet, Tricia. Glad you find the tips I learned interesting, too. The nut butter sauce is a good one as well. Thanks for stopping by! I love that you're trying new pancake techniques! It's funny how something seemingly small can make such a huge difference. These look awesome! I totally agree with you. I have more and more horror of reading "healthy" "vegan" "0% fat"... I think we should stop following these trends and focus on the joy of eating, live and share... When I travel in underdeveloped countries, people are HAPPY to be able to eat one meal a day in order to survive. That said, these pancakes look fantastic and I will definitely try the buttermilk pancakes, with a twist... with plenty of blueberries. Definitely a lot of shortcomings on this little blog space, I'm afraid. That is one very tempting stack of pancakes and I love that your mix is made from oats and whole wheat flour. Yes, those pancakes were surprisingly awesome. I'll definitely make them again - great with fruit. And how about just a little bit of chopped walnuts on top of that sauce and bananas...great idea. Thanks for stopping by, Bobbi! I have to stop coming to my own blog and looking at these pancakes because it makes me want some and I thought I was the savory breakfast eater in the family. : ) Yay for weekends, breakfasts, and pancakes. Hope you're doing great, Kelly! I want to bite into a huge stack of these! How soft and fluffy these pancakes look. Love the twist. We love pancakes here, so I can tell we would love these with blueberries. My husband loves blueberry pancakes but I never can keep them around long enough to cook with them...just once in a while! Yes, time for some pancakes when you next need a little comfort food in the morning? :) Thanks for swinging by, Bianca...enjoy the weekend.